The Edmund Rice Christian Brothers Art Foundation, LTD has been established to preserve and promote the very significant heritage of works of art produced by Brother artists in North American. 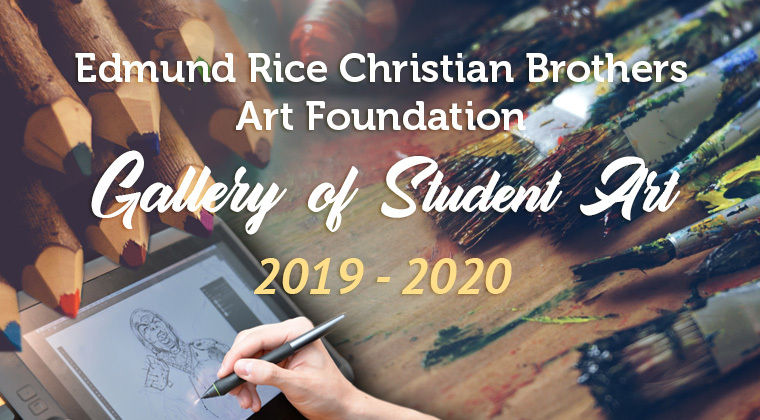 Mindful of the treasured place of art in Catholic tradition and education, the Foundation, in collaboration with the Office of Educational Services, seeks to stimulate the art programs of our schools. Earlier in the academic year, schools received the following invitation: By whatever means are most appropriate, select works of two student artists that will attest to the place of art in your school. The Gallery of Student Art section of this website (click here) presents images from the young artists in Edmund Rice Christian Brother schools. They, as well as their teachers and school leaders, are to be congratulated on the enthusiastic participation in this inaugural event. We ask your attention, but also your reflection on what we might do to afford our students the time, space, resources, opportunities and stimulation to realize and appreciate the artistic graces they receive in abundance from the Master Artist. I hope that this note finds you well. We had a very successful, purposeful, and mission driven Catholic Schools Week. Two young men that I know you would love inspired a key lesson in an important faith-based day that concluded Catholic School's Week here at CM.